Travel these days is relatively easy in Poland. There were absolutely no problems at the German border going in either direction. Passports were glanced at without leaving the car and we were waved on our way. 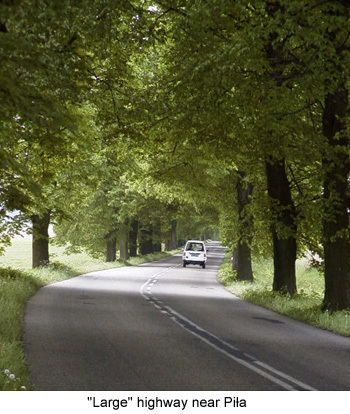 The roads are for the most part narrow, one lane in each direction, with beautiful large trees lined up like sentinels along each side, just a few feet from the pavement. No road-widening will be possible without destruction of thousands of them. The paved surfaces appeared to be pretty well maintained, but were gullied and uneven from side-to-side from constant heavy traffic which included everything from field tractors to huge transport trucks, busses and autos. Many autos looked as though they had come off second-best in passing encounters along the way. In fact, passing is nearly impossible since passing lanes are almost never provided, even on longer grades, except on a few major arteries near large cities. We found comfortable hotels near most of the larger towns, and fuel is available everywhere. There were even McDonald's restaurants in a few places, but we took most of our meals at the hotels for convenience. The food is good and plentiful, including meat, potatoes and lots of veggies. We loved being there during the spargel (asparagus) season. I don't recall seeing much seafood though the many lakes in the north must produce lots of fish. Our meals, lodging and auto fuel all together averaged less than $80 per day for the two of us. Had we known, we might have spent less time in Germany this year! We expected communication to be a problem since neither of us could speak a word of Polish, but we found that our English and fractured German worked pretty well. Eventually we at least learned the word for "thank you".